Our knowledge of plant molecular biology is biased towards the model plant Arabidopsis, the focus of intense genetic study and the first plant genome sequenced. The general assumption is that understanding developed in this model system can be applied directly to other plant species. While this is often true, it is becoming increasing clear that perspectives developed from this single plant species should be applied cautiously to other systems. This is particularly true for distantly related monocot plants, such as wheat and barley. The molecular pathways controlling vernalization-induced flowering illustrate this point. In Arabidopsis the FLC gene plays the pivotal role in controlling the induction of flowering by the prolonged cold of winter (see Amasino 2010). After intensive study of temperate cereals and related grasses it seems that the key gene controlling the vernalization response of these plants is VRN1, an APETALA1/FRUITFUL-like (AP1/FUL-like) MADS box gene (see Trevaskis 2010). AP1/FUL-like genes do not have the same role in Arabidopsis. Recent studies indicate that mechanisms that accelerate flowering in response to long days might also differ between Arabidopsis and the grasses. A study by Chen et al. (2014) shows that PHYTOCHROME C (PHYC) is critical for long-day induced flowering in wheat. Phytochrome proteins act as photoreceptors. 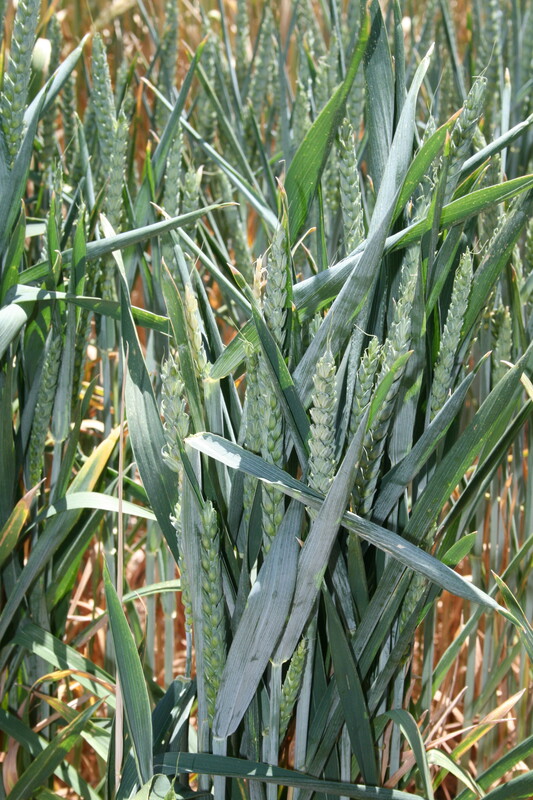 Loss of PHYC function in durum wheat (Triticum turgidum) delays flowering in long days. The late flowering phenotype is associated with altered circadian rhythms and reduced FLOWERING LOCUS T-like 1 (FT1) expression (Chen et al., 2014). FT1 normally promotes flowering in long days, so an inability activate expression of this gene might explain the phenotype of the PHYC mutant. Other recent studies show that natural variation in PHYC underlies differences in daylength sensitivity amongst barley cultivars, reinforcing the importance of this gene in the photoperiod flowering response of temperate cereals (Nishida et al., 2013, Pankin et al., 2014). The major role of PHYC in the long-day flowering-response extends to other grasses. In Brachypodium distachyon, a model grass related to temperate cereal crops, loss of PHYC function also delays flowering in long days (Woods et al., 2014). Like the wheat PHYC mutants, Brachypodium PHYC mutants show altered expression of circadian clock genes and reduced FT1 expression (Woods et al., 2014). Constitutive expression of FT1 in a Brachypodium PHYC mutant promotes early flowering, supporting the idea that FT1 acts downstream of PHYC to accelerate flowering in long days. PHYC does not play a role in accelerating flowering in long days in Arabidopsis, so the findings of these recent studies raise an important question: to what extent do the pathways controlling the long-day flowering response of temperate grasses overlap with those of Arabidopsis? Long-days induce expression of FLOWERING LOCUS T (FT) genes to accelerate flowering in both Arabidopsis and the temperate grasses (Amasino 2010; Turner et al., 2005; Lv et al., 2014). It is possible that there are only minor differences between the mechanisms that sense daylength to activate FT genes in these different plant lineages. Different phytochromes potentially function in a shared daylength sensing pathway, for example. Alternatively, there might be more radical differences in the way that Arabidopsis and the cereals sense and respond to daylength. There are indications that this might be the case. For example, a PSEUDORESPONSE REGULATOR (PHOTOPERIOD1) regulates daylength sensitivity in cereals but has no direct functional equivalent in Arabidopsis (Turner et al., 2005). The unexpected importance of PHYC in regulating the long-day flowering response of grasses highlights the need to place understanding of the functions of genes developed in Arabidopsis into a broader context of how these functions are recruited into biological roles in other plants. The study of Chen et al. (2014) also provides a clear demonstration that molecular genetic approaches that have proven so successful in the study of Arabidopsis can be applied directly to a polyploid crop with a large genome. This type of research is essential if we are to understand the pathways controlling seasonal flowering-responses of temperate cereal crops and apply this knowledge to crop improvement. Amasino R. (2010) Seasonal and developmental timing of flowering. Plant Journal, 61: 1001-1013. Nishida H, Ishihara D, Ishii M, Kaneko T, Kawahigashi H, Akashi Y, Saisho D, Tanaka K, Handa H, Takeda K, Kato K. (2013) Phytochrome C is a key factor controlling long-day flowering in barley. Plant Physiology 163: 804-814. Trevaskis B. (2010) The central role of the VERNALIZATION1 gene in the vernalization response of cereals. Functional Plant Biology 37: 479-487. Turner A, Beales J, Faure S, Dunford RP, Laurie DA. (2005) The pseudo-response regulator Ppd-H1 provides adaptation to photoperiod in barley. Science 11: 1031-1034. This entry was posted in Barley, flowering, Uncategorized and tagged Ben Trevaskis. Bookmark the permalink.